This week has definitely been made for grilling. Lots of raw foods, but the little bit of cooking that I did needed to be outside of the house. 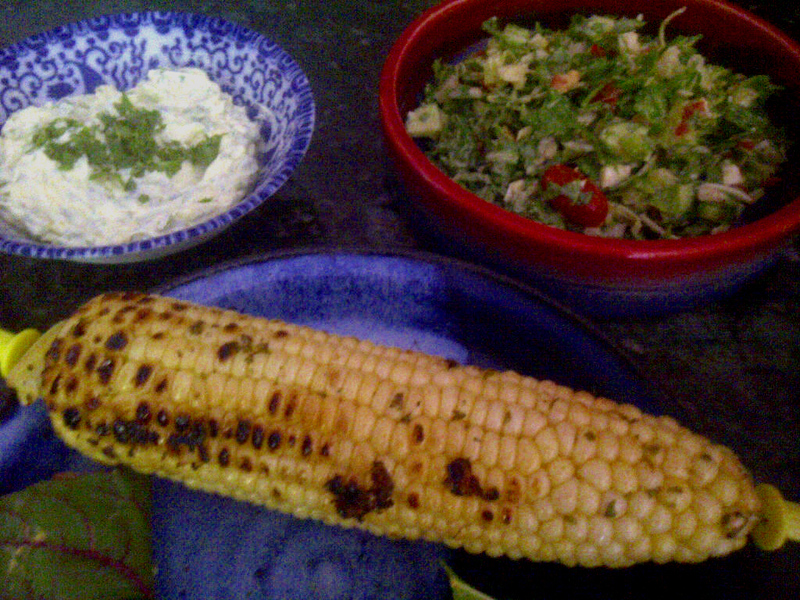 And corn on the cob is one of those things that I try to do often during the summer, especially when it can be grilled. To add a little bit of zip to it today, I added the bright flavors of cilantro and lime. This is one of the easiest recipes to make corn taste great. All it takes is some lime juice, some chopped cilantro, and I added a little bit of grapeseed oil to help it adhere to the corn a little better. I juiced 3 limes, and chopped about a half cup of cilantro. Shuck and clean the corn, and place on a square of foil. 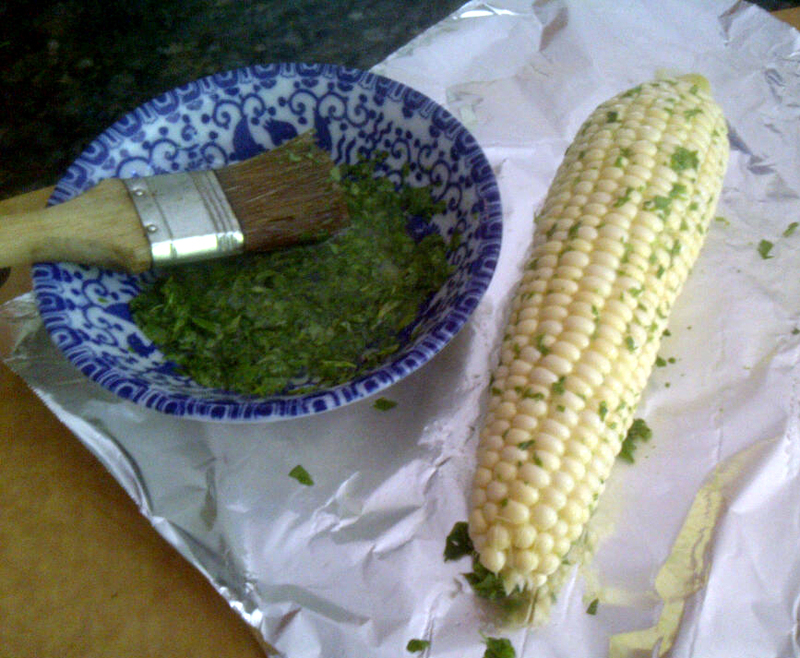 Mix a couple of tablespoons of lime juice, a few large pinches of cilantro, and about a tablespoon of grapeseed oil in a dish, and brush it evenly on the corn. I like to prepare each ear right on the piece of foil that I’ll be grilling it in so that anything that falls off is wrapped up with the corn. Place on a grill that has been heated to a medium temperature, and grill for 5-10 minutes per side (depending on how hot your grill is). You can tell when it’s close to done when the lovely scent of popcorn comes wafting out….. The creamy result is in the dish at top left, shown here with our other lunch fare ~ salad with tahini dressing, and peeking in the lower left corner is a chard leaf (fresh from the garden) rolled up with some spicy hummus, tomatoes and avocado. sounds really lovely, I can’t wait to try this!